There are many scenic campgrounds in Charleston, SC. Whether you're looking for a fully outfitted RV camping facility or a scenic location to enjoy tent camping, you're sure to find a perfect spot in this lovely city. The James Island County Park Campground is located on the grounds of the 643 acre park of the same name. Located just ten minutes from the beach and within a few miles of historic downtown Charleston, this campground is one of the most popular campgrounds in Charleston, South Carolina. Campsite options range from primitive tent campsites to modern RV sites with full hookups including 20, 30, and 50 amp electricity. Each campsite has a grill and fire ring. Pull through campsites are available, as are wheelchair accessible campsites. There's a fully stocked campground store featuring groceries, supplies, ice, firewood, and propane. The campground also has a laundry facility and dump station. With its park setting, outdoor enthusiasts will find this campground to be very appealing. Campers can enjoy expansive open meadows and miles of paved trails perfect for cycling, skating, and walking. Those who enjoy fishing, kayaking, and pedal boats can take advantage of the 16 acres of fresh water fishing lakes on the grounds of the parks. Campers can also enjoy fishing in tidal creeks and crabbing from the docks. There is also a fully outfitted playground that children and adults alike are sure to enjoy. During the summer months, campers and park visitors can enjoy the Splash Zone Waterpark and a spray play fountain. Additionally, the park has an activity center and numerous places to enjoy picnics. Meeting facilities are available for groups of all sizes. To reserve your James Island County Park campsite, call 843-795-7275. If you're looking for a top rate campground a short distance from downtown Charleston, be sure to check out Lake Aire RV Park and Campground. Approved by AAA, Good Sam, and Woodall's, this campground has all the amenities discriminating campers could possibly want to enjoy. Whether you're tenting or traveling in an RV, you'll find the parks' campsites to be comfortable and attractive. Full service RV pull through sites are available for rigs of all sizes, including big rigs with large slide-outs. Many of the sites include water, electric, and sewer hookups. Both 30 and 50 amp electricity are available. The campground also has 26 campsites designed specifically for tent campers. Each campsite has a picnic table and fire rings. Free wireless Internet is also available. During your stay at Lake Aire, you can enjoy catch and release fishing in the private lake on the grounds. You can also take a dip in the swimming pool or enjoy tanning on the attached sun deck. There's a fully equipped playground and a pavilion that can be used for picnics, family reunions, and other large group outings. The campground has clean, modern bathrooms with hot showers. Campers also have access to laundry facilities. You can make reservations online or call (843) 571-1271 for more information. Located on the grounds of what was once a historic plantation, Oak Plantation Campground is one of the most scenic campgrounds in Charleston, SC. It's the largest campground in the Charleston area, and is the camping facility located closest to the city. The facility's beautifully landscaped setting resembles a park, allowing visitors to enjoy the beautiful, peaceful scenery for which this part of South Carolina is known. With more than 250 campsites, Oak Plantation can accommodate all types of recreational vehicles as well as tent campers. Campers will enjoy concrete and gravel pads, and 50 amp electric hookups are available. You'll enjoy the convenience of an on-site trading post, stocked with groceries and other types of camping supplies. Wireless Internet is available at all campsites, for a fee. Campground recreational facilities include a pristine outdoor pool and a large, open play area. There's also a large fresh water lake on the grounds, where you can enjoy fishing (no license required). A picnic shelter is available for group outings. Campers have access to clean, modern bathroom facilities with hot showers. For more information, fill out the online contact form or call toll free 866-658-2500. 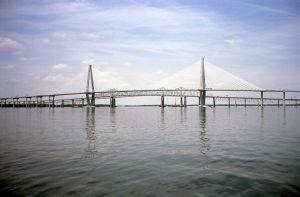 These are just a few examples of the many campgrounds in Charleston, SC. If you're planning to vacation in the area, you may find that one of these camping facilities is the perfect home base for your trip. You can get information about other campgrounds, as well as details about activities and tour packages from the Charleston Convention and Visitors Bureau.